I’ve been working on a huge collection of creatures for Fortuny. 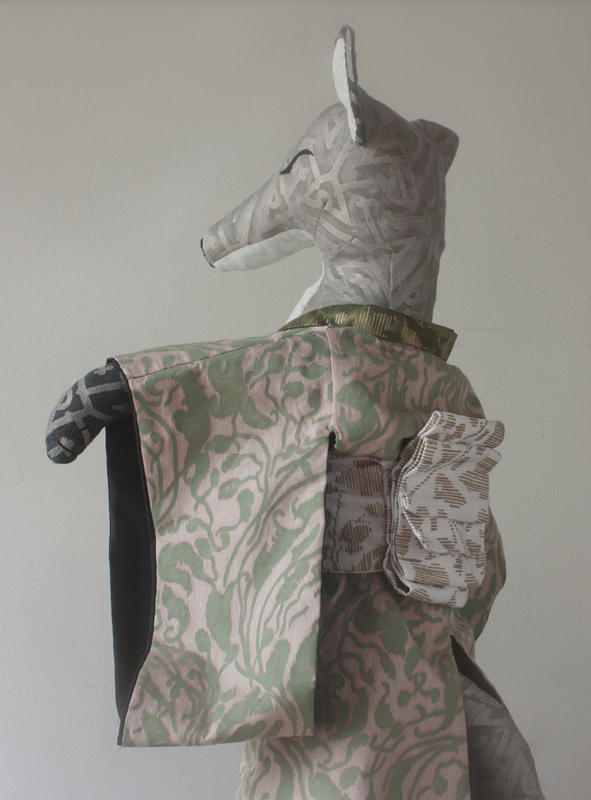 Today I’m fitting patient foxes for kimonos – it takes a long time and they never complain or fidgit – they are always solemn and still. The fit is precise – especially at the back of the neck and they are fully lined and have fancy obis. Sewing them is still complicated for me, it’s a different sort of sewing than I usually do and figuring it out is interesting – it activates my beginners brain – always a good thing. 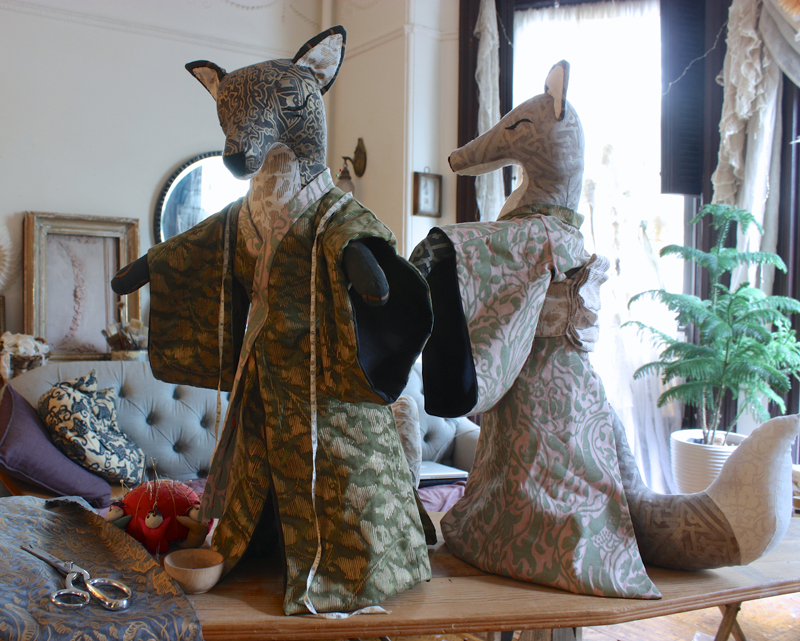 Dressing the foxes reminds me of a story I read as a child. I must have been about nine when I first read it and I still have the book, an illustrated collection of stories for bigger little folks. I still love the idea of a basket of fancy scraps and somebody to dress up. I love the magic you share in little moments or snippets of your life. Yes. A basket of fancy scraps — what could be better?! Enjoy! I agree with Sally up above. Thanks for sharing! Oh my goodness!! This is ringing a faraway childhood bell for me too! I am sure I have seen that illustration and read that story before. I have always been obsessed with scraps and still sew tiny dresses out of them by hand. It always transports me back to my first days with a needle. I wonder if this was one of my origins too! Thank you so much for sharing this! Your foxes are precious. So dignified and elegant. I love your work. Your work is amazing! I love the tiny doll and her clothes. 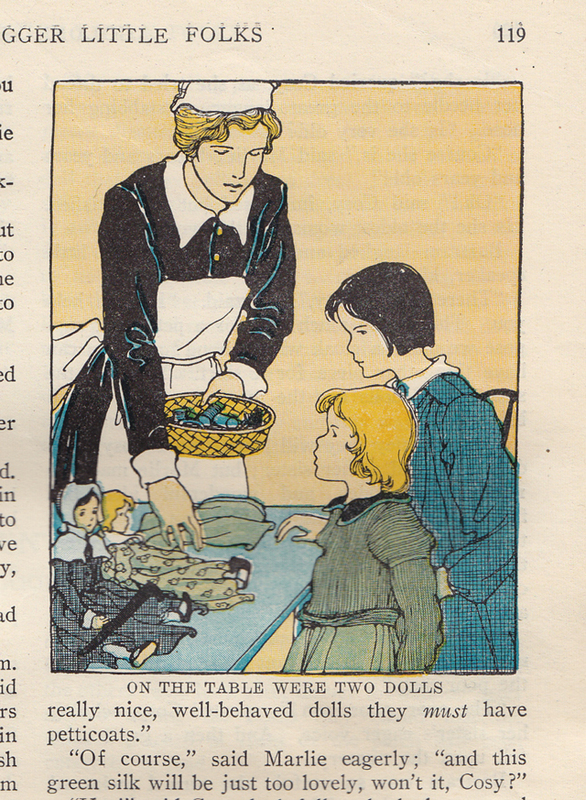 The only dolls I have made were peg dolls when I was about 11 or 12. A neighbour was a seamstress and would give me scraps of material which I would use for my peg dolls. Keep creating your beautful projects and photographing them – they are a joy to see. Best wishes from Liverpool, UK. You had posted, at one time, a tutorial on stuffing your dolls. A reader had sent you a technique that you thought was great. I can’t seem to find it anymore. Can you help?